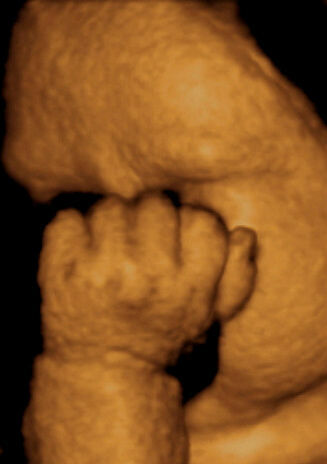 This baby’s hand is in the same position as in the image opposite, with the fist held tightly in front of the face. All of your baby’s movements help to build muscle strength and aid co-ordination, whether it’s a kick or simply curling and uncurling the fingers. With labour imminent, you’ll be playing the waiting game. Staying active will help the time pass much more quickly. You’ll be resting a lot in the next two weeks.As your figure expands and you become more tired, it’s natural to want to sit out the remainder of your pregnancy at home with your feet up, and put the answering machine on to field all the “Has it arrived?” enquiries! It’s fine to do this but it’s worth remembering that the very best way to stimulate labour is to keep active. What’s more, the hormones produced by even gentle walking will lift your mood and help you to feel more positive when your labour begins. Try giving yourself one or two small tasks each day – perhaps meeting a friend for lunch, taking a very gentle swim, or purchasing some last-minute items for baby – taking care to stop and put your feet up when you feel tired. Be sensible about the type of activities you undertake, and avoid anything that could be overly exhausting or potentially dangerous; for example, bear in mind that your centre of gravity is way off balance at the moment, and that wallpapering the nursery or carrying heavy shopping should definitely not be on your to-do list. It may feel as though your life is on hold at the moment so that’s why it’s good to fill your time as best you can. Don’t forget, however, that in just a couple of weeks you’ll have your newborn occupying all your time. Research has shown that women who listen to music during labour tend to feel less stressed and are less likely to need pain relief. There’s also some evidence to suggest that babies born to the accompaniment of music are calmer. One study compared different beats and found that classical, instrumental sounds were the most relaxing. Familiar tunes and rhythms could distract you from the pain and – if you choose the right track – help you focus on your breathing. Line up a selection of tunes on your iPod well in advance of labour. Try out a selection of music to discover what you find most soothing, or invigorating. Labour is a bit like a mini-marathon and listening to the right tunes might just help you get to the finish line.